About two years ago, I realized that the most common answer to the question, “How are you?” is, “Busy”. Busy? That’s how we describe how we are?! Busy? Do you want to know what this answer means to me? Like I said: Yuck. Bleck. Phooie. The word doesn’t even sound pretty. Say it aloud five or ten times and you’ll hear it in all of its aggravating beauty: Busy. Bizzy. Bizzzzzy. SO anyway, at the time, Ryan and I agreed that the word “busy” was off-limits for our family. We were no longer allowed to describe ourselves with that pesky word. This little editing decision has changed our lives. Well, at first, it made me entirely too judgmental of folks who persisted in answering, “Busy!”. But, when I repented of that and calmed myself down a notch, I began noticing that, because we had agreed not to describe ourselves as “busy,” we were proactively avoiding busyness. Plain and simple. We occupied our time with people and activities that we really believed in and enjoyed; we avoided schedule-stuffers. And, two years later, I’m here to testify to the beautiful peace of not being busy. Wanna join us in the editing room? Pocket some convincing ways to say “no”: 100 funny ways or 20 real ones. 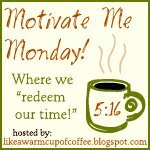 Check out how other women are redeeming their time through Sarah Mae’s Motivate Me Monday!